I was getting little tired of only using spaghetti squash as spaghetti. I wanted to create a side dish that was unique, easy and oh yeah, cheesy. I find the easiest way to make spaghetti squash is in the Instant Pot. Here’s my blog post on how to do it! Once you’ve got your spaghetti noodles, simply toss them in a bowl with some simple ingredients and bake it topped with a layer of thinly sliced zucchini. 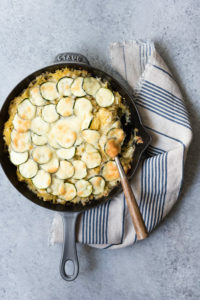 Cheesy Spaghetti Squash Zucchini Bake that makes a great side dish for any meal! Preheat oven to 400 degrees. Heat an oven safe skillet or cast iron pan over medium/high heat. Add olive oil, onion, 1/4 teaspoon salt, pepper, and thyme. Cook for 3-5 minutes until onions begin to soften. Add the minced garlic and cook an additional minute. Turn off heat and set aside. Scoop the cooked spaghetti squash noodles into a large bowl. Add 1/4 teaspoon salt and 1/2 cup cheese. Stir to combine. Stir in the onion mixture until well combined. Pour mixture back into the pan and layer the sliced zucchini on top in a single layer. Drizzle lightly with olive oil then top with remaining shredded cheese (plus a little more if you’re feeling crazy). Bake for 25-30 minutes until cheese is bubbly on top. Serve immediately. Looks fantastic cannot wait to try!